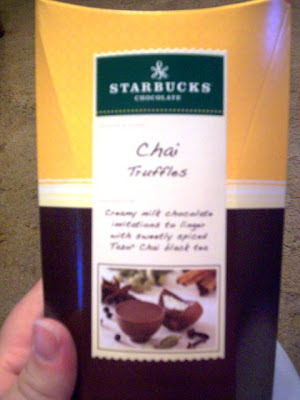 The new line of Starbucks truffles are some of the most delicious - and expensive - candies that Mom and I have ever eaten. At a whopping $4.99 per box (and there's only 10 candies in that box), we've only broken down and purchased them when they were at a $3.99 sale price AND when Mom had a $1 off coupon, which - coincidentally - is found inside each box of chocolates. Each flavor that we've tried has been phenomenal (espresso, mocha, vanilla), but the one that has stuck out the most for us has been the chai. Since Mom had scored a coupon out of our last box of candies and they were on sale this week at Stop & Shop, we decided to get another box of chai truffles. THE VERDICT: Deliciously sweet and spiced. The milk chocolate coating is thick and rich, while the creamy center tastes exactly like a cup of Tazo Chai black tea, which is what the candy is flavored with. Even when you unwrap the truffle, you can smell the distinctive aroma that only chai has. The Starbucks candies are great to eat alone (God knows you can go through that small box by yourself), but they're decadent enough to put out when company stops by. We'll definitely get them again ... but only when they're on sale.